Clan wars is a mini-game located in level 25-28 of the wilderness. There are two portals that you can enter, the white portal is safe, where you won't lose any items, the red portal is dangerous, and works like wildy, your items will be lost on death. Currently, the Purple portal has no use. First go to the quest tab, and select the red star. The white portal is used if you want to practice your PKing ways, or if you want to test certain gear and inventory set ups. As you lose no items upon death, this is a good way to practice. All types of gears work in this portal. This is usually a popular place for when there are PK Tournaments happening, as the participants won't need to pick up the items, and trade them back to their opponent. The red portal can be used if you want to have a 1v1 with someone outside of the wilderness, but still have the risk in the fight. There are certain gear sets that won't work in this portal; Armadyl armour, Torva armour and Bandos armour. This is more for low gear set risking like; Rune armour, Green D'Hide and low level bows such as Oak. If you use this portal, you will lose your items upon death. Clan Wars is usually used as a place for a PKing Clan to regroup, after they have finished a War, or if they need to regroup in able to go back in again. 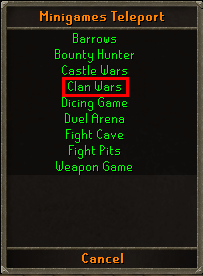 Clan Wars can also be used for clans to 'suprise' attack by teleporting to Clan Wars and walking to Avatars. 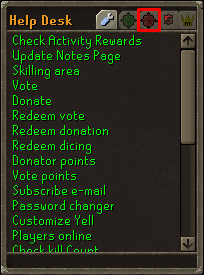 Clan Wars itself can be used for clans to PK right outside the Safe Zone for fast re-gearing.